A couple of weeks ago i had the chance to be taught Navajo plying by Debbie from the Iron Horse Farm. One evening, blogless Danielle (Ravelry link) and myself went to her house with our wheels and after about an hour we had it down! 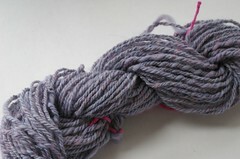 I had a lot of trouble with the single I brought with as it kept on breaking and I couldn’t get going with the plying. 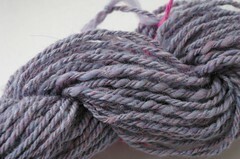 Debbie lent me some of her roving that she’d spun so that I could still practice. At first I didn’t really pay attention to how the colors were working out but after a while I attempted to keep the colors together although without much success. Debbie suggested I respin my single to add some twist into it and hopefully prevent it from breaking so I did that the next day. As it is best if the single rests for a couple of weeks before Navajo-plying I waited until this weekend to try again. My single was so full of twist that it was a bit difficult to control and I ended up having little squigglies here and there sticking out of my 3-ply. But I was able to ply it entirely and got a good practice out of it. My single was a solid color so I didn’t get to practice keeping the colors together. But I’ll make sure to pick a multicolor roving next time I do this! I don’t know when I’ll start spinning regularly again as my eyes and fingers are more attracted to my sewing machine than my spinning wheel but I’m sure the bug will bite me again some day! Nicely done! That’s a technique I don’t know yet. It looks great – navajo plying is tough and my yarn still feels like cord when I do it that way but I really want to get it right.